Family Explorers is a project made possible by the North East’s strong cultural partnerships. Born out of research commissioned by NGCV, it provides a platform for peer recommendation, a factor that has been shown to give families the confidence and information they need to try new events, venues and genres. I share information online through our website, facebook group and enewsletter about the 35 venues, 2 festivals and 16 organisations that are involved in Family Explorers NE, including all the NGCV partners. The most recent to join is Great Exhibition of the North and our intention is that Family Explorers will play a key role in building excitement around the event as well as enabling families to help shape it and provide ongoing feedback. The project began in 2013 with a small pilot. 5 years on, there are over 7,000 families on the Facebook Group and nearly 2,000 receiving the e-newsletter. Growth shows no sign of slowing. Earlier this year, Facebook Insights were introduced giving us more information than we’ve ever had before about this community. There are key influencers on the group including the most prominent family bloggers in the region. We are committed to ensuring we reach a wide demographic and this includes across the generations. We’ve recently received a small grant from the Family Arts Campaign to help us involve more older people – so far we’ve run a Facebook advertising campaign targeted at over 45s during which 346 people joined the group. More is planned in the lead up to the Easter holidays. We are also liaising with organisations such as Creative Age and the Quality of Life Partnership to spread the word and ensure our content is age-friendly. 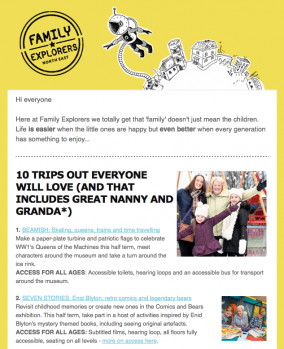 We've recently produced an 'intergenerational special' e-newsletter and are mindful of the Family Arts Campaign's Age Friendly Standards when we talk about and recommending events. Our intention is to continue our dialogue with projects that can help us to broaden our audience including City of Dreams and our region’s Creative People and Places initiatives, making the most of any chances to work together to meet mutual aims. As the project matures, we’ll also be looking more closely at governance and how to grow the project further so that more organisations and families can benefit. We hope to secure funding to find out more about the families we are engaged with and gather more evidence of how effective the project is being at meeting our aims of providing the information and inspiration for families to broaden their cultural experiences. With this knowledge we can fine tune Family Explorers North East to make the most of this wonderful opportunity we have to talk with and listen to these thousands of families.